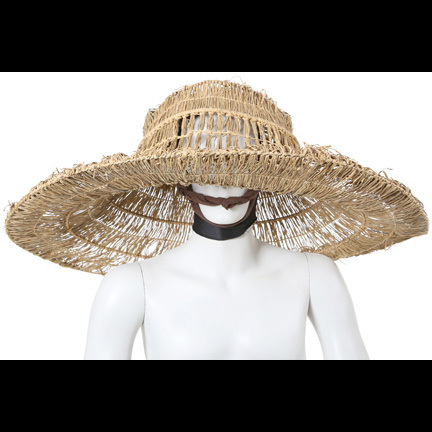 This oversized hand woven straw hat was worn by the character “Lightning”, portrayed by actor James Pax in John Carpenter’s 1986 cult classic Big Trouble In Little China starring Kurt Russell and Kim Cattrall. 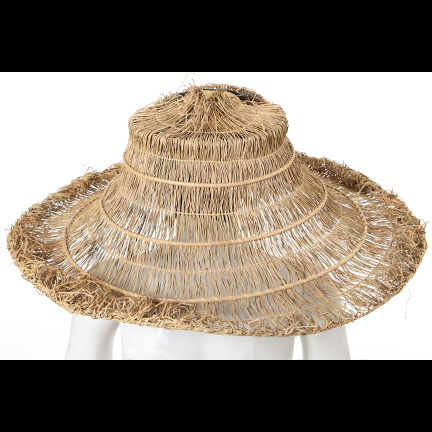 Mr. Pax wore this exaggerated version of a traditional Chinese style hat in multiple scenes throughout the film along, with the other two “Storm” characters, “Thunder” and “Rain” (portrayed by Carter Wong and Peter Kwong respectively). 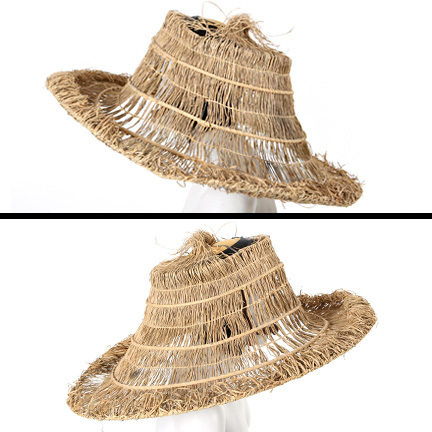 The hat measures approximately 30 inches in diameter by 14 inches tall and has the original black stretch fabric cap with Velcro neck closure attached to the inside crown to keep the hat in place, and attached brown cloth strips with fixed knots used as chinstraps as seen in the film. 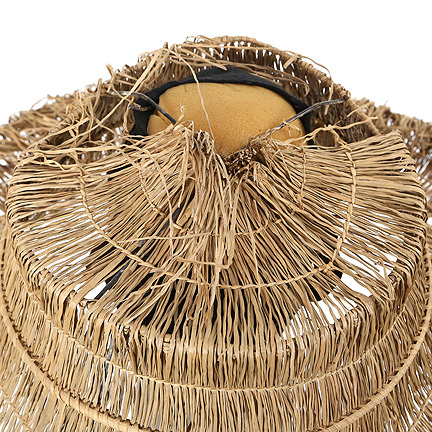 Some of the straw at the top of the hat is missing and has deteriorated due to age. 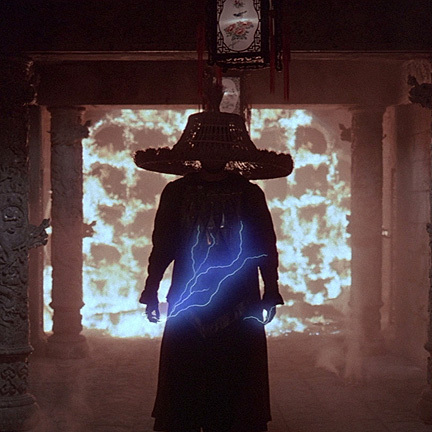 Mr. Pax first appeared wearing the hat in the scene where “Jack Burton” (Russell) and his friend “Wang Chi” (Dennis Dun) stumble across a gang fight in an alleyway of San Francisco’s Chinatown and witness the arrival of the three Storms”, who descend from the sky and use their supernatural powers to disperse the enemies of their master, the evil magician “Lo Pan” (played by James Hong). 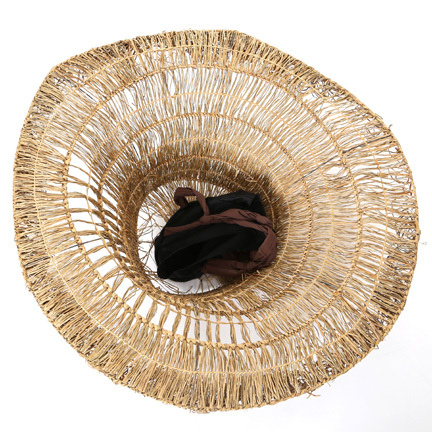 Lightning and his partners disable several gunmen with their throwing knives and produce individual weapons to continue the battle (Lightning’s weapons of choice being a set of steel blades that whirl in the palms of his hands). 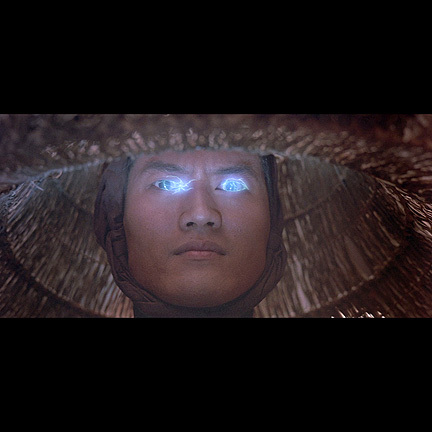 Burton and Wang then drive through the alleyway, forcing the three to avoid being run over. 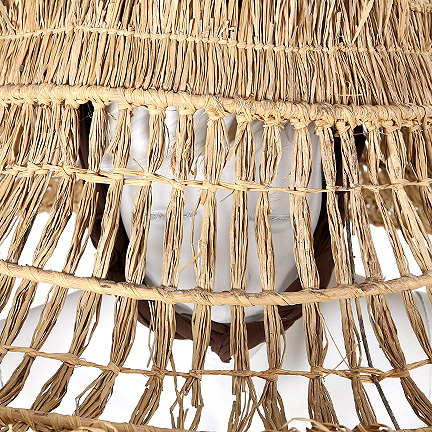 Lightning wears the hat in subsequent scenes throughout the majority of the film; during the sequence where the Three Storms kidnap Wang’s girlfriend “Miao Yin” (portrayed by Suzee Pai) from a local brothel in order to enable Lo Pan to marry her and become flesh again, and in later battle sequences inside of Lo Pan’s lair, “The Wing Kong Exchange”. 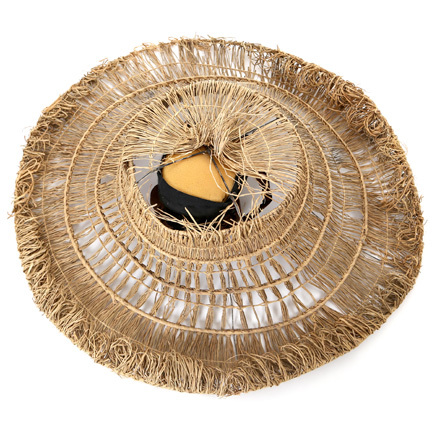 Mr. Pax appears wearing the hat for the last time in the film when Lightning attempts to stop Burton and his friends from escaping The Wing Kong Exchange through a hole in the ceiling. 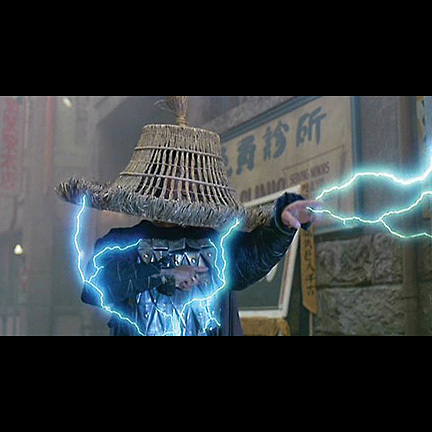 As Lightning “powers up” his electrical abilities in order to attack Wang, Egg Shen (played by Victor Wong) drops a large Buddha statue down the hole, sending it crashing down onto Lightning’s head (a separate “stunt” hat was used at the end of the sequence). 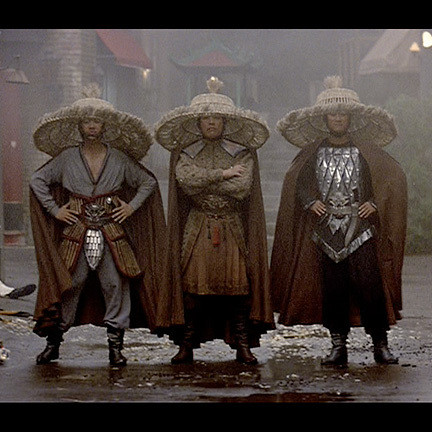 In an interesting side note, the signature look of the Three Storms hats created for Big Trouble in Little China later inspired the look of the character “Raiden” from the Mortal Kombat franchise. 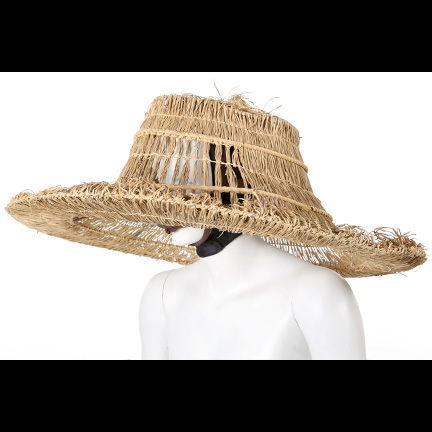 The item is in good screen worn condition and is accompanied by a letter of authenticity from the costume house that supplied the wardrobe to the production.